to the dock dedicated to the export of petroleum products. The inspection of the pier has been conducted since mid of January and is currently in the stage of marine engineering, which qualifies it to the final stages after flooding the basin area dedicated to docking with 18-meter seawater. 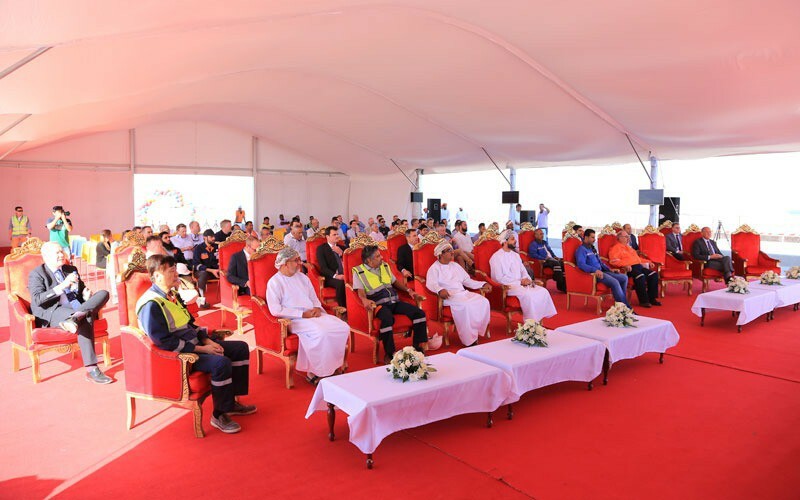 This came in a ceremony organized by the company today in the port of Duqm in the presence of a number of officials from the Special Economic Zone Authority in Duqm (SEZAD), Duqm Development Company, Duqm Refinery and Port of Duqm, in addition to representatives of the companies executing the project, consulting companies, subcontractors and a team of engineers. The length of the oil berth- which cost about RO200 million – is one kilometer equipped with buoys and navigational aids, two berths for big ships and tankers for the export of petroleum and petrochemical products, where each berth accommodates the anchoring of two ships. While the work is underway to complete the rest of the construction work of the oil berth, the stage of drilling on land has been completed and work is underway in the drilling and deepening in the sea. The amount of required drilling is about 26 million cubic meters of material extracted from the drilling to deepen the port basin, which leads to the oil berth to reach a depth of more than 18 meters. Approximately 5 million cubic meters of this material will be used to reclaim and fill the dock site. The implementing company also reclaimed 2.4 km from the area adjacent to the secondary wave breaker, which is 4.6 km long. "The project is an important addition to the history of the company, and the pavement works according to the approved plan. The completion rate exceeds 85% of the basic works," said Bart Brupper, project manager at Boskalis Westminster Oman Limited. In addition, for this 12 million m3 water, equaling 6000 Olympic swimming pools or 1 billion buckets where brought in the pit. This was done through four one mater dimeter pipes by means of gravity, and controlled by four siphons.